I received word last week, while at the grocery store, that I am now a Signature Member of the National Watercolor Society. I was so excited!! I would have jumped around and cheered, but I think the other shoppers would have thought I was loony! I have aimed for this honor for many years now and it is still a little hard to believe! My painting also received the Holbein Award and will go on the traveling show for 1 year. If my memory serves, when my painting went on the traveling show in 2008, I think it stopped in about 5 different cities during the year. When I know the cities locations for this year, I will publish them. 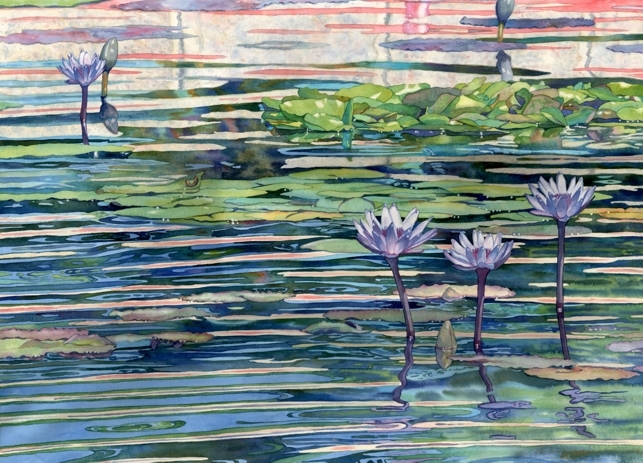 If you don't know the process of getting into the National Watercolor Society show and receiving Signature membership, here it is: The National Watercolor Society along with the American Watercolor Society and the Transparent Watercolor Society of America are some of the top US watercolor shows. As it says on their website, the National Watercolor Society began life in the 1920's as the California Watercolor Society. To enter this national juried show, you send 1 image. This one image is then juried along with about 1,000 other images by three nationally known watercolor artists. These three artists cannot talk during the jurying process. They look through all of the 1,000 images the first time without voting, then they begin the first round of voting. Each of the three artists says yes or no anonymously to each image and generally it takes quite a few rounds of this before they have selected the 100 images out of the 1,000 that will be included in the show. This year was different, though, in their long history, this was the first year that all 100 paintings received 3 votes in the first round of voting! So, it should be a very strong show! Most watercolor societies have a tiered structure to their membership. In most, anyone can be an Associate member, at any level of their watercolor abilities or someone with just an interest in art or the watercolor medium. The next level is Signature Member. A signature member has to complete the societies rules for attaining Signature membership and these requirements vary from society to society. Once an artist has a painting selected for the National Watercolor Societies Annual Exhibition they can apply for Signature membership. To apply the artist must send 3 matted paintings, separate from the piece juried into the show. Then 3 jurors, separate from the 3 previous jurors and also nationally recognized watercolor artists, look at the 3 matted paintings that the artists sends. They are looking for a consistent high quality of watercolor and ability to repeat this high quality. All three jurors must agree in awarding the artist Signature Membership. If you see a watercolor where the artists signature includes the initials, NWS, you know the process they had to take and the honor it is to achieve this level. Congratulations again Lori. Thanks for explaining the process. It is a lot of work and something not easily achieved. Gosh, I couldn't pass one juror in Rocky Mountain, nor two jurors in Transparent WS. I didn't really expect to on my first tries. Maybe I should pass on these and go directly for NWS...one day...don't feel I'm quite ready yet. You've been at this longer than I, and you very well deserve this honor. I know you'll now be putting NWS after your signature...how cool is that!